This game is probably one of the better Genesis shooters out there. Probably the thing that makes it different from the rest is that it actually has a story to go along with it and continues throughout the game. 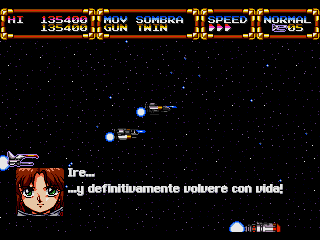 The game itself I don’t think plays any different from your typical shooter, but it does mix up the formula later on. There’s a bit of survival mode that you’re forced to go in, which was a little stressful for me because I barely made it. 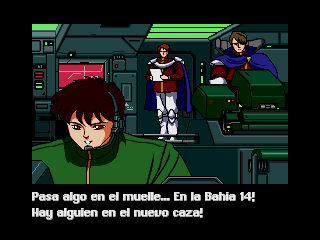 I believe you were forced to control another ship that you were trying to rescue. 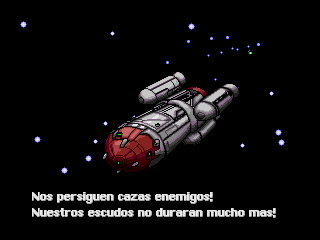 Anyway I was never able to beat the game because of the final boss. I didn’t use cheats, but even with savestate abuse I just couldn’t beat that boss. It was really tricky and I eventually gave up. 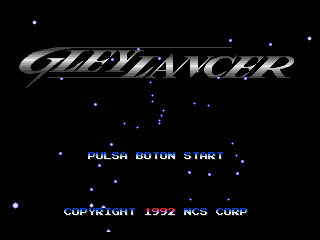 Translation to Spanish for “Gley Lancer”, for the Sega Genesis/Mega Drive. 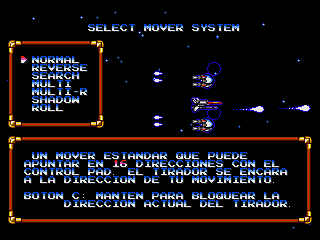 Lacks translation for some static screen texts (like options) Based on the English version by M.I.J.E.T.